Louis La Louis La Grenade (1733-1808) was a remarkably successful entrepreneur of French descent. 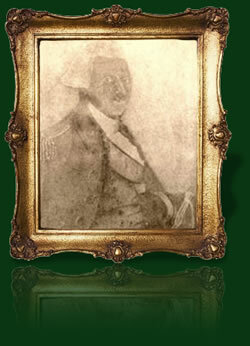 The Captain was one of the first free coloured men to acquire substantial land holdings in Grenada. He commanded the St. George's militia (hence his title) and occupied a position of prominence in the official life of Grenada. He owned schooners for shipping the sugar and spices he grew on his own plantations. In the course of sailing his ship 'La Louise' through the Islands, Captain Louis La Grenade offered a free trip to a Dutch missionary from the Banda Islands (Indonesia), who in gratitude gave him some dried nutmeg seeds and entrusted him with the formula for an exotic liqueur. The family history of La Grenade confirms that the Captain owned an estate in Mardi Gras, St. Paul's, Grenada. The present family plot is part of that estate and his tomb in Morne Jaloux has been designated a historical monument. Family lore has it that, on this estate, Captain Louis La Grenade, through association with the missionary, experimented and grew a few nutmeg trees as early as 1773. Grenada is today the second largest producer of nutmeg and mace in the world.